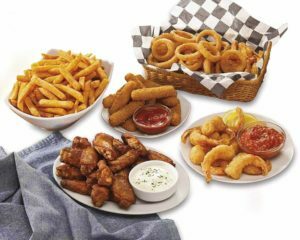 Deep fried food can be so delicious to make at home, but it does come with its own set of safety concerns. If you have kids or pets and are worried about having a fryer in your kitchen, we have found the best deep fryers that have all of the standard features that you need. We then take it one step further to find the best safety features that will reduce the chance of burns, stop grease spattering all over the place, and stop other accidents that can occur with these types of appliances. So sit back, relax, and enjoy your fried food safely in your home with the following fantastic fryers. 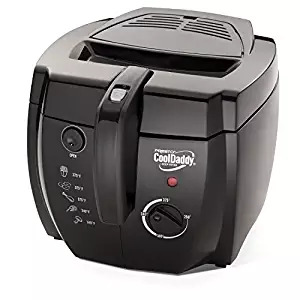 One of the most popular and well-reviewed models that also has excellent safety features is the Presto 05442 CoolDaddy Cool-touch Deep Fryer. To help the whole deep-frying process be safer this device has a cool touch exterior, a lid that you can lock and a large viewing window that lets you view the food without having to open the cover. It also allows you to lower the basket into the oil while the lid closes by using an exterior basket handle; this is a great safety feature that stops oil spattering. One of the essential safety features to have in a deep fryer is a breakaway power cord. A breakaway cord is one that is attached to the appliance with magnets, so if there is a slight tug on the cable the power cord will detach from the unit. It is crucial to stop the machine from being pulled over and dumping hot oil all over the place. The other notable features on this appliance are the adjustable thermostat, the indicator light that lets you know when the oil is ready, and the charcoal air filters that absorb the majority of the odors from the cooking oil. The Presto is also a relatively easy model to clean. The removable filter makes it easy to strain the grease, and the inside container and the lid both come right out making them super easy to clean. Since this Cool Daddy lets you close the lid when in use, it does not make a mess with grease splattering all over the place. It is large enough to cook for a family of 2-3 with no problem. The oil capacity is 1.9 liters or 2 quarts, and this model is available in either black or white. The standout safety features on the Hamilton Beach Deep Fryer are the cool touch sides, the securely closing lid, and the breakaway cord. It is also a popular choice for those who want an easy cleanup since the top keeps the splatters to a minimum and it does have the all-important viewing window, so you can monitor the cooking without having to open the lid. This unit is known for its quick heat up time, and it’s easy to clean up features including a removable cover, heating element, and enamel-coated oil tank. This model is relatively small at only 1.9 liters, so it works well if you are cooking small batches in one basket — the oil capacity 1.9 liters. 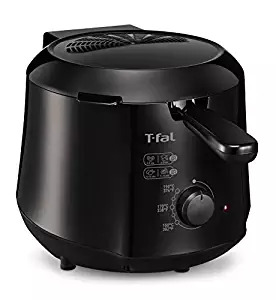 The T-fal 7211002145 FR8000 Oil Filtration Deep Fryer is missing some of the safety features like cool touch exterior and auto shutoff, but it has quite a good oil filtration system that will keep you safe when you are cleaning up. It is the largest capacity design on our list, and it does have a secure lid that will stop oil from splattering. The rectangular unit has handles on the side if you want to move it around. This device has a really good feature of a drawer that holds the cooled oil once it has gone through the filter. You can put most of the pieces of this unit into a dishwasher for cleaning (not the cord or the heating unit obviously). It can hold quite a bit of oil (3.5 liters) and a decent amount of food. It is easy to clean up and fairly lightweight if you need to move it around (without the oil). It is also straightforward to drain the oil, and it has a safety feature on the device that doesn’t allow you to remove the oil for at least three hours after using the machine, so you won’t accidentally burn yourself on the hot oil. The T-fal FF230850 Cool-Touch Mini Deep-Fryer is a compact unit that has a cool touch exterior and a magnetic cord. It is good if you are only looking to cook small batches. This model isn’t quite as easy to clean as the models listed above since the inner bowl isn’t removable, but the basket, the handle and the filter are all removable and easy to clean once they are out. The other thing to note about this model is that the lid doesn’t completely close, so there can still be a little bit of splatter. On the plus side, it is quite small and pretty easy to store; it even has a folded basket handle takes up less space when put away. It also has an adjustable temperature feature that shows you what temperature to use for the type of food you are cooking. Unfortunately, it doesn’t have an indicator light to let you know when the oil has reached the right temperature. It has a 1.2-liter oil capacity. If you still aren’t sure about the safety of the products we list above, you should have a look at some of the air fryers that are super popular these days. Air fryers are kind of like deep fryers but they use barely any oil. 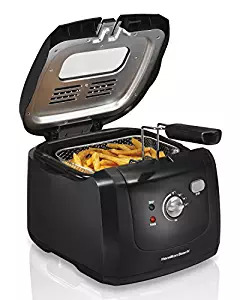 Some people compare them more to small convection ovens than deep fryers, but they do an excellent job cooking things like fries with much less oil. A good one to check out is the Secura Electric Extra Large Capacity Air Fryer. Hot oil can burn skin quickly and can start fires if not handled properly. The most important thing you need to do before using your appliance is to read the instruction manual. You may have had other models in the past, but the importance of looking over the instructions over at least one time cannot be stressed enough. Never overfill your appliance with oil, it can spill or leak. Teach your children about the dangers of hot oil and to stay away from the appliance. Ensure you have a fire extinguisher on hand. Water and hot cooking oil are a terrible combination. If water comes in contact with hot oil, it can splatter and burn your skin very quickly. Avoid any water contact with the appliance or with the oil. If you use this kind of device, you need to know how to put out a grease fire, which means never use water on this type of fire. To put out a grease fire, you must use a fire extinguisher or cover the fire with a lid to stop it from getting oxygen. Don’t overfill the basket, as it may cause the oil to overflow. Don’t leave your fryer unattended. Cool Touch Exterior — Having a cool to the touch exterior is a nice to have feature, especially if you have children in the house. Oil can heat up to 400 degrees which can cause the exterior to also heat up to the point that you could get burned. Break-away Cord — A breakaway power cord is the standard type of cable for deep fryers to prevent the unit from tipping over if someone pulls on the wire. They are held to the machine with magnets and will easily break away from the appliance, so it doesn’t tip over. These types of magnetic cords are pretty essential to prevent accidents but can be a nuisance for some people because they detach very easily. Secure Locking Lid- One of the most straightforward ways to stay safe when deep-frying is to get a model that has a securely locking lid. If the model has a top, you will be able to avoid grease splashing all over your countertops and lessen the chance of burns. The other upside to having a cover is that it should reduce the amount of odor that is released from the cooking, especially if it has a charcoal filter. Indicator light – Having an indicator light on your unit will allow you to know when your food is ready without having to lift the lid and risk oil escaping the device. Automatic Shutoff — Auto shutoff if the oil gets too hot is a nice to have feature, although it isn’t super common on the most popular models. If your oil gets too hot, it could create a flame. Food Capacity – The capacity of the unit refers to the amount of oil that the device can hold for the cooking. If you are cooking for one or two people a few times a week, the models that have 1.9-liter capacity should be sufficient. If you are preparing a meal for a crowd, you will want to look for models that take 3.5 liters or higher. You may also want to look for products with more than one basket. Adjustable Temperature Settings – An adjustable thermostat is a great feature if you are making lots of different types of food that require different heat settings. Built-in Thermostat – A built-in thermostat is a great feature that can be convenient for cooking, while also being good for safety as you may see if the oil is getting too hot by checking the thermostat. Drainage System – Dealing with the oil after you have used it is usually the worst thing about deep-frying at home. Some models are designed to make cleaning up the oil a little more comfortable with drainage systems that remove the oil from the machine through a hose in the front of the unit, that makes dealing with the oil and cleanup much more manageable. Baskets – Depending on how and what you are cooking, you may want to find a model that has more than one basket. Make sure the basket has a cool grip handle, so there is no chance of being burned by the oil. You can get devices that allow you to lower the basket into the oil after the lid closes by using an external handle. Oil Filter– One of the downsides of cooking fried food is the odor when you heat the oil, to cut down on the smell you can look for models that have oil filters that can catch some of the smell of the oil. Charcoal filters seem to be the most effective for odor reduction. Easy to clean –You may love the taste of home-cooked fried foods, but avoid doing it yourself since it is kind of a hassle to clean up. 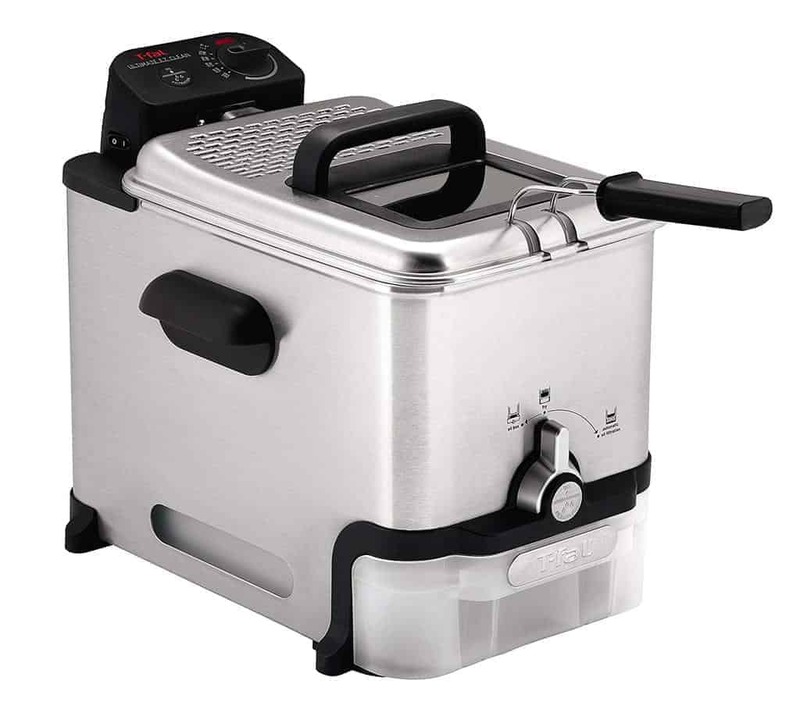 The most current generation of fryers are all designed for relatively easy cleanup; they have removable parts that are easy to clean with soap and water and are often dishwasher safe. They come with non-stick material making them easy to wipe clean. Size– Unless you are frequently cooking for a lot of people, you may want a smaller appliance that is easy to store and doesn’t take up too much room on your countertop. Viewing Window – Having a viewing window in the lid is a great feature that allows you to check on your food without having to remove the lid and possibly burn yourself. Price– If you are using the fryer to cook for a few people a few times a week, you don’t need to spend much more than around $60. You can get much more expensive models, but often the more you spend the bigger, the devices are going to be. Unless you are planning on cooking for large groups of people, most people like a moderately sized unit that isn’t too hard to store or that doesn’t take up too much counter space.